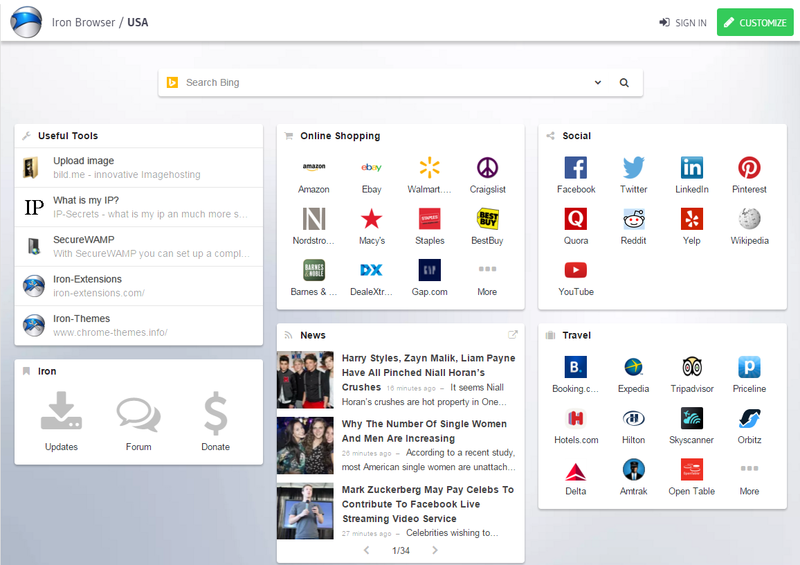 The web-based start page solution provides advanced bookmarking capabilities; support for RSS feeds and thousands of widgets that help users connect to their cloud services right from their start page. Today, SRWare and start.me announced the integration of a new personal start page service in the popular Iron browser. The start page can be accessed at https://iron.start.me. Users can use the start page anonymously or register for a free account to take full advantage of the cloud. SRWare has developed the popular alternative web browser Iron. Iron is based on the open-source Chromium project. The first version was launched in 2008. Iron has seen over 1,000,000 installs and is popular because of its enhanced privacy features. start.me has developed a modern start page that is used by over 700,000 users every month. start.me’s white-label start page solution helps browser developers and portals to increase user-engagement and generate revenue through start.me's built-in monetization platform. For more information about start.me, please visit https://start.me/about. STARTME - Fast, clean, effective start page.